French pharmaceutical company Biogaran, a subsidiary of the Servier Group, specialized in generic medicines, announces the launch of its operations in Ivory Coast. In the long run, Biogaran will be seeking to expand from Ivory Coast to all French-speaking West and Central African countries. 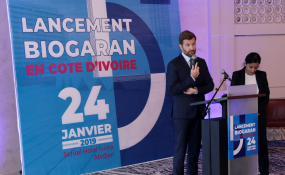 Abidjan, January 28, 2019 – French pharmaceutical company Biogaran, a subsidiary of the Servier Group specialized in generic medicines, announces the launch of its operations in Ivory Coast. Since the beginning of January, Biogaran has been selling 14 medicines from its range of more than 800 drugs. The launching ceremony was held in the presence of French Ambassador's Counselor, Ms. Annick Diener and of the Minister of Health and Public Hygiene of Ivory Coast, Dr. Aka Aouélé Eugène. Biogaran's drugs portfolio covers a wide range of diseases that are increasingly present on the African continent such as diabetes, high blood pressure and bacterial infections. 11 of the 14 drugs sold by Biogaran are labeled essential and responding to public health challenges, according to the World Health Organization (WHO). "Biogaran wishes to promote access to quality healthcare in West and Central Africa. We want to offer products that meet European standards at an affordable price. Thanks to an encouraging business climate and to strong logistical facilities, Ivory Coast appears to be the ideal base for our deployment in French-speaking West and Central Africa", says Emmanuel Le Dœuff, Biogaran's General Manager and International Affairs Director. Biogaran's presence in Africa is already established since 2017, through Swipha, a Nigeria-based drug production and distribution company. Servier is an international pharmaceutical laboratory governed by a Foundation and headquartered in Suresnes, France. With a solid international presence in 149 countries and a turnover of €4.152 billion in 2017, Servier employs 21,700 people worldwide. Fully independent, the Group reinvests 25% of its turnover (originator business) in Research and Development and uses all its profits for the benefit of development. The Group's growth is based on a constant search for innovation in five areas of excellence : cardiovascular, immune-inflammatory and neurodegenerative diseases, cancer and diabetes, as well as an activity in quality generic drugs. Servier also offers e-health solutions that go beyond drug development.